BRIDGETOWN, BARBADOS-The first time that you climb the ladder from dock to gangway to board the 227-passenger Royal Clipper, you will know instinctively that your week on the world’s largest sailing vessel will be unlike any other cruise. 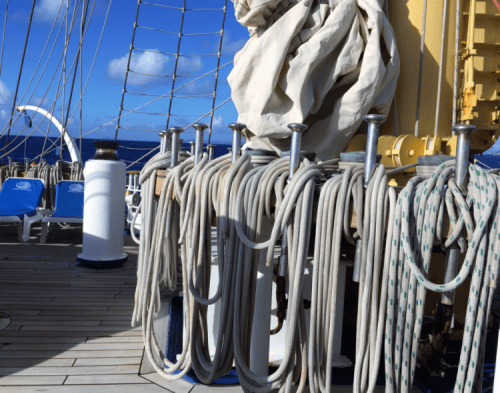 That ladder moment is too late to decide whether you favor the ride and rigging of a glorious sailing ship or prefer something that is steadier, roomier, and more luxurious on a much bigger vessel. On the Royal Clipper, you will be among passengers who chose this type of cruise to revel in the motions of the sea; to feel the wind as it works its magic among 42 sails that propel the ship forward; and to share the open top deck with five masts and enough cordage to allow a hustling crew to raise, trim and lower the sails. Sometimes, you need to get out of their way. In an age of boxy cruise ships that look like floating hotels, the sleek Royal Clipper is a wonder. This ship grants passengers a peek into the past, when ocean transportation was ruled by capricious winds and sailors had none of the building materials of today — 56,000 square feet of Dacron sails, metal masts and hulls, and navigation equipment far more accurate than a gaze at the stars. The romance of the voyage and the joys of sailing lure vacationers aboard. Deck hands are the stars of the Royal Clipper show, especially when they climb the rigging to make an adjustment or repair. Motor-driven cruise ships hide their operations crew below decks, but on this ship, passengers meet and get acquainted with crew members as they rest between scurries to maneuver the sails. You might even get a lesson in tying knots. For the more adventurous, at least once a week when the ship is in calm waters, passengers may line up to don a protective harness, then make their own climb into the rigging to reach a platform 60 feet above the deck. Why? To say you did it and to produce proof of the experience on Instagram. My recent voyage aboard Royal Clipper began in Bridgetown, Barbados, the ship’s home port for the winter, before returning to the Mediterranean for the summer season. We motored out of the harbor in mid-afternoon. Then, with the triumphant theme song from the movie 1492: Conquest of Paradise as background, the ship soon was at full sail, tilted a bit to the port (left) by strong winds off the Atlantic, and moving enough that passengers needed to use one hand to hold onto something if they wanted to change seats or use the stairs down to the covered deck below. The open top deck was the popular place to be whenever the ship was sailing during the day. Folks I asked said they were having a delightful time; several indicated they were grateful that they had packed pills or patches to ward off motion sickness. 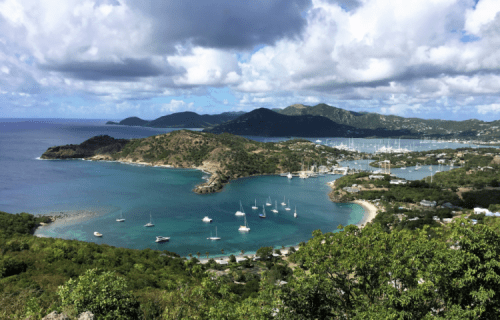 Our itinerary that week was typical of the smaller ships that cruise the Caribbean, aimed less at cities and shopping, more toward off-of-the-usual-course islands, towns and beaches. With the Royal Clipper at anchor, passengers tendered ashore at Rodney Bay, St. Lucia; Deshaies, Guadeloupe (which replaced hurricane-damaged Dominica); Falmouth Harbor, Antigua; St Kitts; Terre de Haut, Iles des Saints; and Anse D’Arlet, Martinique. At St. Kitts, we visited Basseterre in the morning, then anchored for the afternoon in South Friar’s Bay. 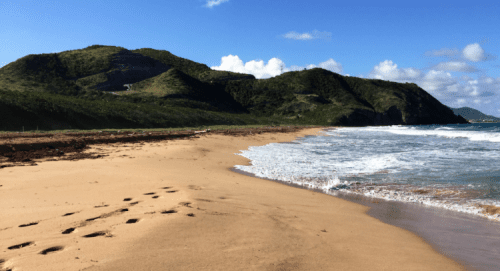 This is the thinnest part of the island, a strip of land that runs between the Caribbean side and the heavier surf of the Atlantic Ocean, to the east. My wife, cruise travel writer Fran Golden, and I decided to explore the Atlantic side. Within a walk of about 10 minutes, we found a path to the ocean and a wide, empty beach for walking and sitting during the rest of the afternoon. Another shore highlight awaited us at a restaurant in Terre de Haut, Iles des Saints. Fran asked a storekeeper for a recommendation to eat the best Caribbean lobster on the island, and off we walked to Le Triangle. 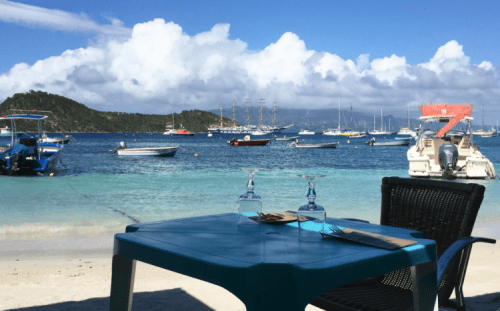 Our lunch was at a table on the beach in the Terre de Haut harbor — grilled lobster and a bottle of good French rose wine were all that we had hoped for. Dinghies and sailboats bobbed at their moorings just off the beach. Farther out, we could see the Royal Clipper, at anchor, with the island of Guadeloupe behind it. 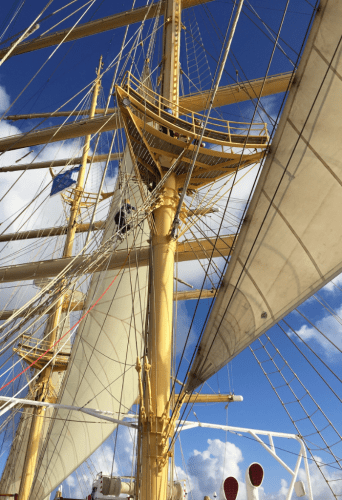 For a sailing ship, Royal Clipper is especially roomy. 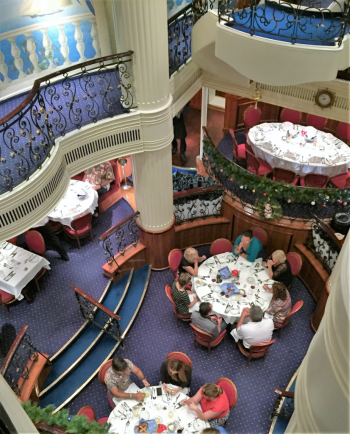 The dining room — serving well prepared food during at least two hours of open seating at each meal — and inside lounge never seemed crowded, though the ship was not full. Entertainment was simple, including a pianist and occasionally a band from shore. One night the crew and passengers enthusiastically performed a talent show with lots of laughter. The ship has a swimming pool. The bridge often is open for passengers to peek in and ask questions. Royal Clipper is the largest of three ships in the Star Clippers fleet that includes Star Flyer and Star Clipper. A fourth ship, Flying Clipper, is under construction to become the cruise line’s largest vessel, carrying 300 passengers and 140 crew members. 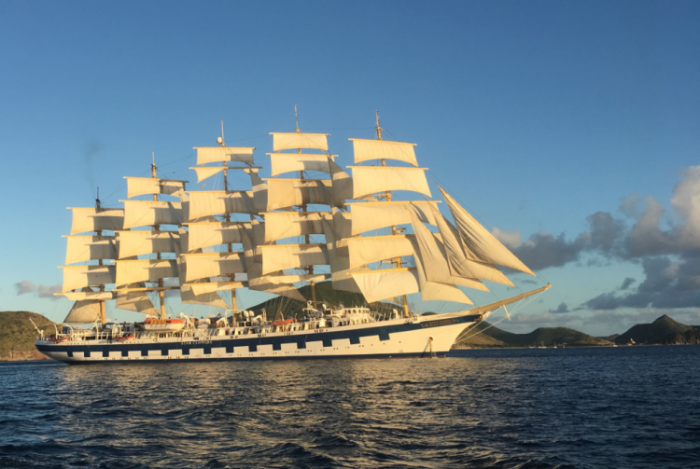 The Star Clippers line is a reminder that one of the major vacation attributes in the modern cruise industry is that its ships offer a huge range of styles, atmospheres, and sizes. 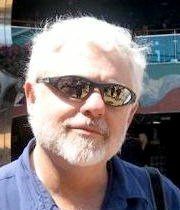 So, if you are thinking about your first cruise or expanding your cruise choices beyond old favorites, you will want to do some homework about the ships. If sailing is your goal, contact Star Clippers (www.starclippers.com) or consult with a travel agent who specializes in cruises — long before you start your climb to the gangway. We did same trip. If you love sailing it is a must do experience. 5 stars easy, best kept cruise secret.